Bed rest and cardiac failure contribute to the common occurrence of thrombosis and embolism associated with myocardial infarction. Only 10% of patients have clinical features of thromboembolism, but in almost 50% of patients who die there is evidence of emboli. 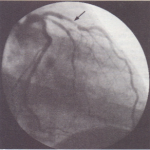 Deep venous thrombosis is the most common manifestation, and pulmonary embolism may result from this. 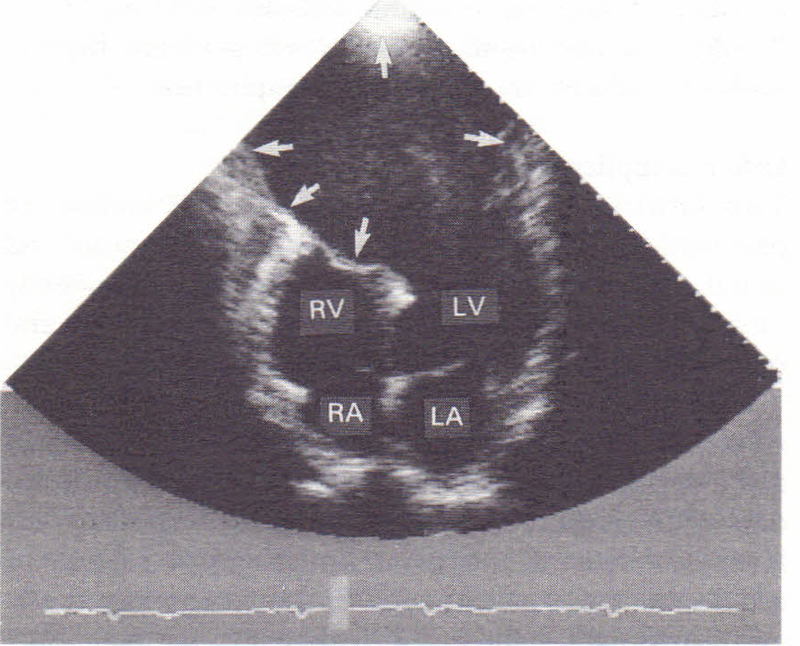 A left ventricular mural thrombus may form on the endocardial surface of the infarcted region. Such a thrombus is dislodged, forming a systemic embolus, in 15% of cases. Prophylactic anticoagulation with subcutaneous heparin probably reduces the risk of this complication. THE SHOULDER-HAND SYNDROME. This consists of pain and immobility of the left arm in the weeks and months following an acute myocardial infarction. Early mobilization reduces the incidence of this symptom and physiotherapy improves those symptoms that do occur. PERICARDITIS. 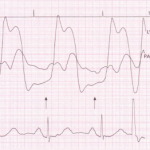 This is characterized by sharp chest pain and a pericardial rub. It frequently occurs in the first few days after an acute myocardial infarction, especially following anterior wall infarction. Anticoagulation should be avoided in these patients and anti-inflammatory medication is usually a successful treatment. POSTMYOCARDIAL INFARCTION SYNDROME (DRESSLER’s SYNDROME). This occurs weeks to months after an acute myocardial infarction, and consists of a combination of pericarditis, fever and a pericardial effusion. It is caused by an autoimmune response to damaged cardiac tissue and is more common after second or subsequent myocardial infarction. Anti-inflammatory medication, including systemic corticosteroids, may be necessary. Anticoagulation should be avoided. 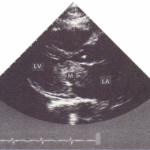 LEFT VENTRICULAR ANEURYSM. This is a late complication. 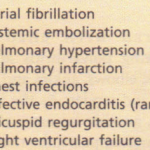 Patients present with heart failure, arrhythmias or emboli. It is characterized by ventricular asynergy, often palpable as a double impulse, a fourth heart sound, persistent ST segment elevation on the ECG and sometimes a visible bulge on the chest X-ray. 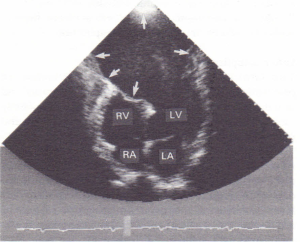 Diagnosis is confirmed by 2-D echocardiography. Treatment includes suitable antiarrhythmic drugs, anticoagulants and medication for heart failure. Surgical removal of the aneurysm (aneurysmectomy) may be necessary if arrhythmias or embolic or haemodynamic complications occur. Any abnormalities that are detected should stimulate further investigations such as coronary angiography and left ventriculography. 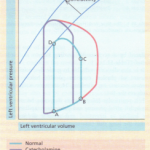 Attempts to provoke ventricular tachycardia by right ventricular pacing must be conside red for identification of patients at high risk of sudden death. Revascularization is probably beneficial for some patients with certain arteriographic patterns of coronary disease . The most appropriate therapy for other high-risk patients is under investigation. After a patient has presented with myocardial infarction every opportunity should be taken to modify risk factors for coronary disease. The patient should be instructed to stop smoking. High blood pressure and lipid abnormalities should be corrected. The families of young patients who present with myocardial infarction should be screened for lipid abnormalities and other risk factors. Structured psychological and physical rehabilitation schemes are valuable but are only available in a few centres. The patient may return to work after 3 months. Car driving is not permitted for 6 weeks following myocardial infarction. Heavy goods (and public service) vehicle driving licences are withdrawn pending evaluation of the patient’s status. The patient should be discharged taking regular f3-blockade (e.g. propranolol 80 mg twice daily or metoprolol 50 mg twice daily), which has been shown to reduce the incidence of sudden death in the 6 months following acute myocardial infarction. Timolol 10-20 mg daily and probably other f3-blockers are similarly effective. Routine treatment with other antiarrhythmic drugs has not proved beneficial in reducing the incidence of sudden death following myocardial infarction. Long-term aspirin (150 mg daily) further reduces cardiac events following myocardial infarction and long term anticoagulation may be advised for patients with large antero-apical infarction. ACE inhibitors should be continued probably indefinitely. Statistics concerning sudden death from acute myocardial infarction and from other cardiac causes are so often combined that it is difficult to accurately assess the mortality specifically from myocardial infarction. Assuming that all sudden unexpected cardiac death is due to myocardial infarction, then about 50% of those who die do so within the first 2-3 hours, and 75% of the deaths occur within 24 hours. Of those who leave hospital alive, about 15-25% die in the first year, and thereafter the annual mortality is 5-10%. Fifty per cent of myocardial infarction victims survive for 10 years. 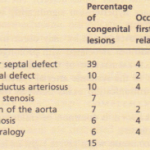 Factors suggesting an un favourable prognosis include a large myocardial infarction, heart failure, a large heart on chest X-ray, ventricular arrhythmias, multiple infarction, recurrent angina, and an abnormal exercise test.